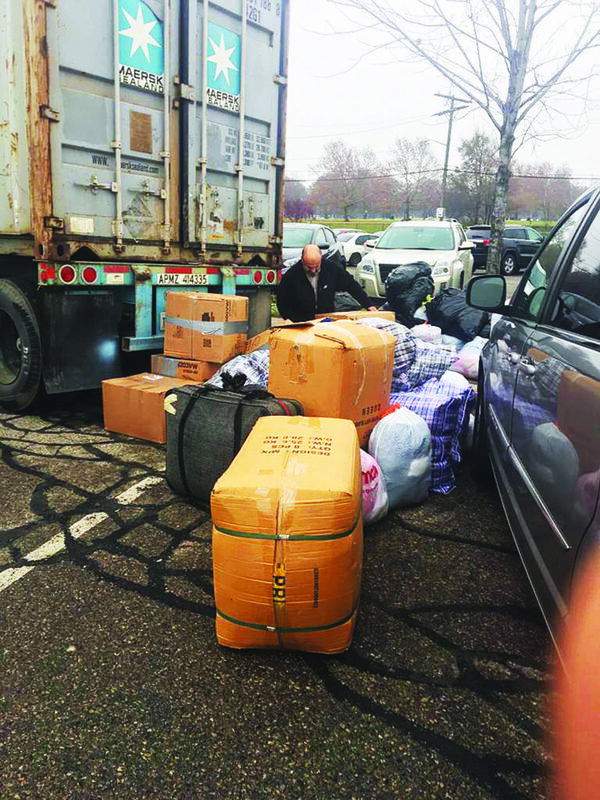 The Rahma Relief Foundation loaded five containers of donated blankets, shoes, coats and school supplies headed to Yemen from Dearborn, Michigan. DEARBORN – Yemen is facing the worst humanitarian crisis in modern history, with more than 22 million people, 60 percent of the population, in urgent need of food, drink, clothing and shelter, according to the United Nations. With the ongoing escalation of the armed conflict, the number of victims and displaced persons who find themselves vulnerable to deadly diseases is on the rise. The cholera epidemic specifically has risen, claiming the lives of hundreds of Yemenis last year alone, especially children and the elderly, encircling the humanitarian catastrophe that is deepening and widening over the course of days. 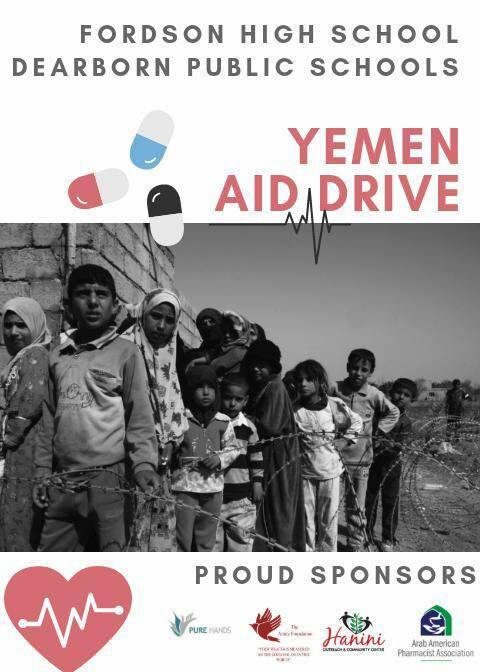 This tragic reality has prompted local Arab American and Muslim institutions in the Detroit area to take initiative and step up the efforts to help those in distress in Yemen. What had a modest start quickly exceeded expectations. 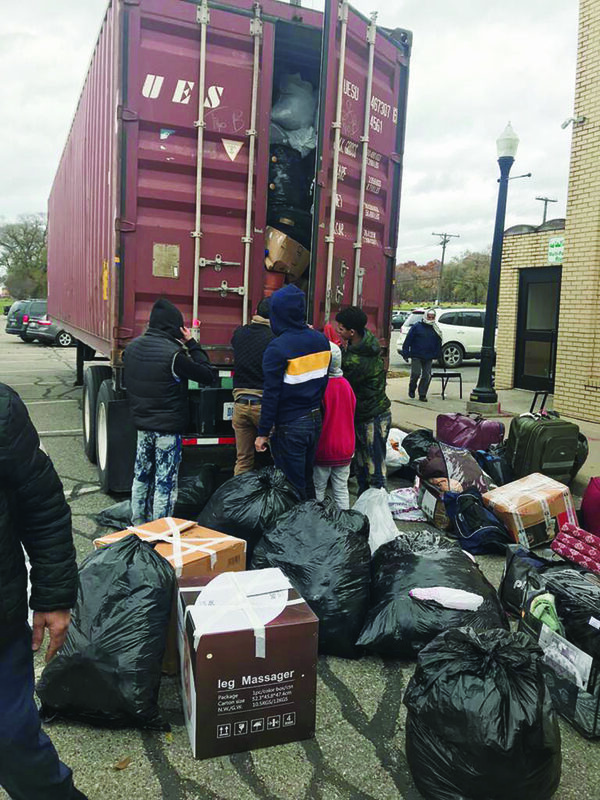 The start was with the Rahma Relief Foundation, which initiated — about three weeks ago — a campaign to collect winter clothes and send a 40-foot container to help the Yemenis at the gates of the bitter cold. The Arab community extended aid to their stranded brothers and sisters and resulted in the processing of five containers of coats, blankets and shoes, as well as stationery, medical equipment and other essential items. Ahmed Al Halabi, director of the Detroit office of the Rahma Relief Foundation, praised the generosity of donors who surprised both organizers and volunteers. 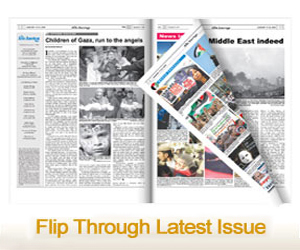 Rahma Relief was founded in 2014 to help the Syrian refugees in Lebanon, Jordan and Turkey. However, as the Syrian crisis receded, the founders of the fledgling institution began to work to help the war victims under siege in Yemen. In the face of multiple crises and disasters in several Arab countries, there is a growing need for donor and philanthropic support, particularly involving European and American immigrants. However, skepticism about the arrival of aid to those in need, especially in the besieged countries, has led many to decline and hesitate to donate. Halabi told The Arab American News that Rahma Relief opened an office in the city of Mukalla, Yemen to ensure the arrival of donations to those who deserve it. The humanitarian foundation had contacted the American Moslem Society in Dearborn (Dix mosque) to coordinate fundraising and packaging prior to shipment to Yemen. In three weeks, the mosque turned into a beehive, a destination for dozens of volunteers and donors, as well as benefactors from Dearborn, Dearborn Heights, Hamtramck, Detroit and Ohio. Khaled Al-Waqidi, vice president of the American Moslem Society, pointed out that the donors were of all Arab nationalities. Among them were Yemenis, Syrians, Lebanese, Iraqis and Palestinians, as well as American Muslims and non-Muslims. “We have paid large donations to use some rooms and corridors in the mosque,” he said, adding that donations mainly included winter supplies of blankets, blankets, clothes and shoes. Five containers filled with donated blankets, coats, shoes, winter clothing and school supplies are headed to Yemen in an effort to help elevate the suffering of children in the war torn country. The drive is organized by the local branch of the Rahma Relief Foundation and supported by many organizations in the Arab and Muslim communities in Metro Detroit. He added that the Dix mosque has always been, “consistent with good deeds over the past decades, even before the Yemeni crisis broke out, and has always been active in all the good efforts in this field. For his part, the assistant imam of Dix mosque, Saleh Haj, said that the unexpected volume of donations required the collection of cash to secure the cost of shipping. The cost of shipping one container to Yemen is about $5,000; and in this context included the donation of some funds required to secure shipping costs. The Islamic Center of America was also among the institutions that participated in the collection of donations to send to Yemen. The owner and president of the Midwest Recycling, Abdullah Hashim, participated in the campaign by providing trucks to collect aid and sort the donated items at his warehouse in Inkster. The donations included 1,000 blankets and 7,000 pairs of shoes, in addition to 3,000 pieces of winter clothes and 3,000 hats. There were diapers for children, crutches and tools to help war casualties. “We expect to send these donations over the next few days,” Hashim said. American activist Maria Qabbani also contributed a pallet of stationery to Yemeni students who lacked school supplies of all kinds, including books, tools, bags, etc. Qabbani, who launched a charity called Orphans of War in Dearborn two years ago, has taken on its efforts to help the displaced in Arab countries as well as Arab and Muslim refugees in the United States. “The important thing is that the materials reach those who need them and those who cannot (get them),” she said. She called on American and Arab organizations and organizations in the Greater Detroit area to coordinate with each other to meet the humanitarian challenges in the United States and in the Arab and Islamic worlds.